The conference will be held from Sunday 5th to Thursday 9th February 2012. It will begin with a late-afternoon reception on the Sunday. The Conference Convenor is Dr Eva Anagnostou-Laoutides, Classics Program, School of Languages, Monash University, Clayton, VIC 3800, Australia. Further enquiries about the conference in general can be sent at this stage to her (Eva.AnagnostouLaoutides@monash.edu.au). 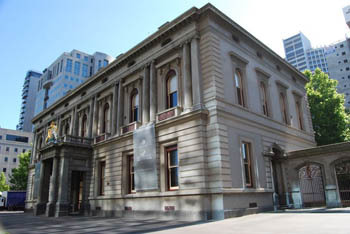 The venue will be in what is now the Hellenic Museum at 280 William Street. Click here for further information. There will be some interesting exhibitions running at the Hellenic Museum at the time of the conference. For details of these exhibitions, click here. No further offers of papers or registrations can be accepted as the deadline has passed. Professor David Konstan from Brown University in Providence, Rhode Island, USA, has accepted our invitation to be the keynote speaker. Professor Konstan has visited Australia a number of times, and is known to many ASCS members for his polymathematic erudition, his lively lectures and friendly personality. Professor Konstan will deliver a public lecture on the Tuesday evening, which will be followed by a reception. Special discount meal vouchers for lunches purchased at locations near the Museum premises will be distributed at registration as part of the conference package for all delegates. There are plans for an excursion to local wineries in the Yarra Valley. Other possibilities for activities and sight-seeing will be put up on the conference website progressively. The Conference Dinner will be held on the evening of Wednesday 8th February at the RACV City Club, 501 Burke Street, Melbourne. The cost, to be paid at the time of registration, will be around $90, with a special discount for retirees and students. Click here for transport information and accommodation suggestions.